When finished you can tap either the Home button or the Power button to close out Camera app and be on your way, never once having to expose a finger to the weather. Is this brilliant or what? No more blustery wind chills, rain, or snow leading to cold fingers and hands, but you’ll still be able to capture all those beautiful wintery moments of fun in the snow. Depending on how thick your gloves are this may end up being easier and more stable than using the volume button since pressing on the earbud buttons obviously won’t jerk the camera around at all. The earbuds trick is particularly useful for anyone who has one of those fancy winter jacket with the built-in earbud controls, or even just a dedicated internal pocket where they lead from providing for easy access. Either the earbuds or volume button trick works to shoot photos on the iPhone without ever touching the screen (and yes it works on the iPad too, but you’re probably not packing one of those around on a snowshoe journey). What About Exposure & Focus? And Lock Screens? This obviously works best if you don’t have a lock screen passcode enabled and if you don’t want to use focus and exposure lock. One goofy workaround is to use your nose to enter the passcode or to hold on to the screen to activate the exposure lock. 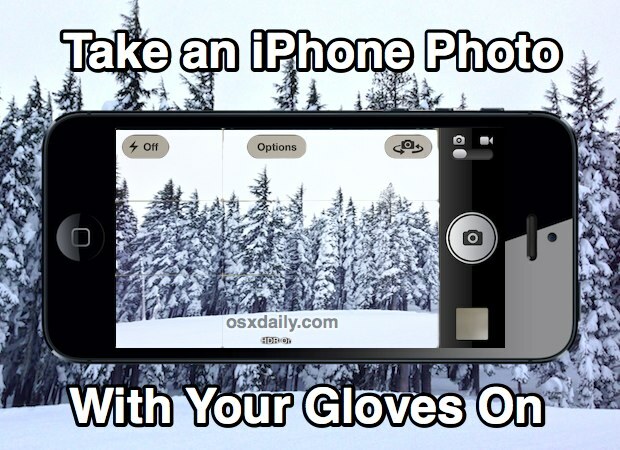 You may look a little silly touching the iPhone screen to your nose but at least your hands will be warm! You could also buy specific touchscreen gloves , which seem to becoming an increasingly popular thing, but that’s really not necessary thanks to Siri and the volume button trick. Enjoy!, because you can actually take a photo with an iPhone without ever touching the screen at all. Thanks to Elizabeth V. for the great tip! But you still have to unlock the phone – either – “slide to unlock” or enter a passcode. You can summon Siri directly from the lock screen. Passcode thing? Well you can take the tipsters advice and poke it with your nose, LOL. I got a pair of REI touch-compatible snow gloves on sale, they are great and the tips are sensitive and work on every screen I have tried in the snow even though thick cases. Many brands offer these now, I think in not too long it will be a standard feature since all phones are touch now and not just iPhone and the bigname Androids. Or just buy Lumia 920 with PureView camera.